Yet another new species for 365 days of orchids is the delightful miniature member of the Oncidium family Rhychostele rossii. As you can see from the photos we have two distinct clones of this species. 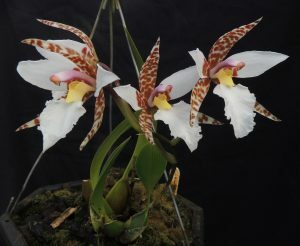 The first has larger pinker flowers with browny-purple spots while the second produces more slightly smaller flowers and is white with orange-brown spots and stripes. 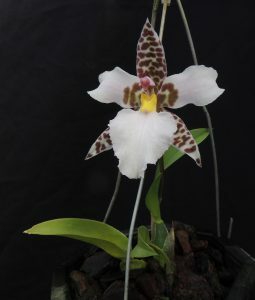 Both clones are lovely and produce the characteristically large flowers (up to 8cm across) on tiny plants with a 2cm bulb topped with a single 5cm leaf. This species is found in the cloud forests of Mexico and Central America, as far south as Nicaragua, from 2000-3000m altitude. As a result the species enjoys cool conditions and year round water. With find flowering is reliably in March and April. We grow our plants in small baskets as we find that although plants enjoy lots of water they like good drainage too, and being miniature are at risk from being outcompeted by moss when grown in a pot. We think that this is a species that more people would love to grow and so the two plants shown have been cross pollinated. Cross your fingers for seedlings available in about two years.